Even if you’ve never heard the phrase “practicing at the top of your license,” you probably instinctively know what it means: it is the idea that skilled professionals should engage primarily in activities that require their level of expertise and skill. This concept maintains that skilled professionals spending their time on unskilled tasks or tasks not requiring their level of education or training will create bottlenecks in a system. Although the genesis of the idea had to do with healthcare productivity and maximizing professional time spent on reimbursable activities, it has important applications to the school-based SLP world, as well. 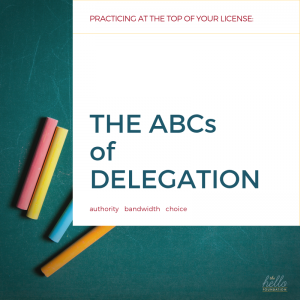 Another term for “practicing at the top of the license” is “skilled delegation.” This is because some form of delegation of tasks is necessary to create a system where everyone is doing tasks that are the best use of their time. This is, of course, easier said than done. SLPs in school-based settings often encounter barriers in the form of Authority, Bandwidth, and/or Choice when striving to practice at the top of their license. Read on to better understand these issues and for some tips on how to overcome them. Who can delegate? SLPs might clearly see the tasks that require their unique skills and training, but without the authority to delegate tasks or a supervisor open to new ideas, change is difficult. Regardless of your decision-making capacity or the support of your supervisor, step one to clearing the authority hurdle is to ask the simple question, “Are you open to hearing ideas about how I could better serve our students by using my time more efficiently?” Remember, you miss 100% of the shots you don’t take. When they say yes (because they almost definitely will), tell them you’ll draft a proposal and send it to them for feedback. If you’re looking to make big changes, ASHA’s workload resources are great for analyzing and organizing your proposal. If you just want to be released from lunch duty, maybe it’s as simple as adding up the minutes per week you spend doing it, proposing what you’d use those minutes for, and the impact that change would have. Whatever you end up with, keep your focus on students and how you can better serve their needs. To whom to delegate? Even when everyone agrees on the assortment of tasks that an SLP is best suited for, there has to be capacity in the system for movement. Schools, on the whole, operate on a tight margin. There is almost never a person with unassigned time or nothing to do, but that does not mean that the system is operating at peak efficiency. When you write your proposal, identify the tasks in your workload that really don’t need to be done at all, those that could be done less frequently, and those that would truly need to be delegated. Meetings and committee work, for example, are huge bandwidth-suckers. For every meeting you go to in a month, closely examine the value of your attendance and what the impact on students would be if you stopped attending or attended less frequently. Is your education and expertise required on the Social Committee for 4 hours per month? Unloading the unnecessary and cutting back on non-top-of-license responsibilities can often relieve enough pressure that the need for actual staffing changes is small or isn’t necessary at all. Why delegate? It’s true. Whether out of habit, need for control, a hero complex, fear, or lack of skills, there are SLPs who would just rather do it all themselves. This is all at once the easiest and hardest barrier to eliminate. This one is all on you. A strong case can be made that our profession has a systemic, cultural problem related to the “Super SLP” identity. And yet, at the end of the day, we are each responsible for our own part in it. I argue that the Super SLP is a myth, and that it is, in fact, damaging to students to believe in it. Sometimes we have to let go of something to be better at other things that make the most of our specialized knowledge and training. Between tight budgets, high caseloads, and shortages of qualified service providers, tough decisions are made every day about what is done and what is left undone. These decisions can be made explicitly, facilitated by an engaged leader (like you! ), or they can be made by default when the issues just aren’t discussed. When workload questions are addressed explicitly, administrators, special education teams, and SLPs can make reasoned decisions about how to complete the work in the most efficient manner. Take a few minutes to think about which of your current tasks truly require your unique training and expertise and get the “top of the license” conversation started. Your students are depending on it!